ORF is a skin infection caused by a virus. It's spread to humans from infected animals (usually sheep or goats). It isn't possible for humans to pass the virus to each other. Symptoms start between three to six days after you've been exposed to the virus. Small red raised spots usually appear on your fingers, arms, hands, forearms or face. The spots can feel sore. The spots can turn into blisters and weep fluid before forming a crust. Symptoms last for three to six weeks. 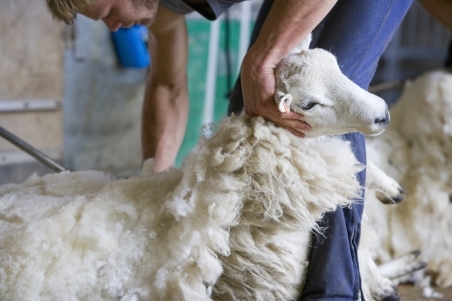 Sheep farmers, shearers, butchers and vets are most at risk due to their close contact with infected animals. To avoid getting ORF if you work with animals, you should practise good hand hygiene. This includes washing your hands with soap and water. You should also wear rubber or latex gloves if you have any open sores and are working near an animal’s mouth. No specific treatment is necessary for ORF. This factsheet explains ORF virus disease, including its symptoms, diagnosis, treatment, and how it spreads. DermNet NZ – ORF. Retrieved November 2017.